Low Carb Tortilla Wraps | Yikes! No Carbs Please! Many low-carbers are lucky enough to be able to buy ready-made low-carb tortilla wraps but alas, they are expensive for me to order from overseas. For quite some time now, I’ve been searching for recipes. The first one I tried was with whey protein and it yielded less than satisfactory results. Yesterday, I had half a roast chicken left and thought I would have another go at making a wrap. Got to try out these recipes some time or other or else I’ll never know. I found the recipe for these tortillas on the Low Carb Luxury website. The recipe says: “Makes 16 tortillas”. Since there were only 2 of us, I thought I would make a half recipe since it was difficult to divide the recipe even more, and freeze the rest. These must be really mini-tortillas because in the end, I only got TWO 20cm wraps! I guess the author must have been referring to corn tortillas. I’ve never seen small flour tortillas. The finished tortilla looked more like a flour tortilla than a corn tortilla. What could one possibly do with such a small thing other than eat more than one as an accompaniment? I somehow forgot to read the recipe instructions and just dumped everything into a bowl and mixed them together. Later I realised that I was supposed to rub in the larb and only add enough water to form a pliable dough. Well, too late. So I had to add about 4 Tbsp of ground flaxseed to firm up the dough a bit. Given the fact that I only got 2 tortillas out of a half recipe and not 8, and that I had to add the flaxseed meal, the carb count did go up to about 7.1 gr carbs per tortilla. Without the flaxseed meal, the carb count goes down to 5.1 gr (net 3.6 gr). I’ll be making this again and will report on it. One tortilla filled chockful of low carb filling is more than enough to satisfy your hunger pangs. 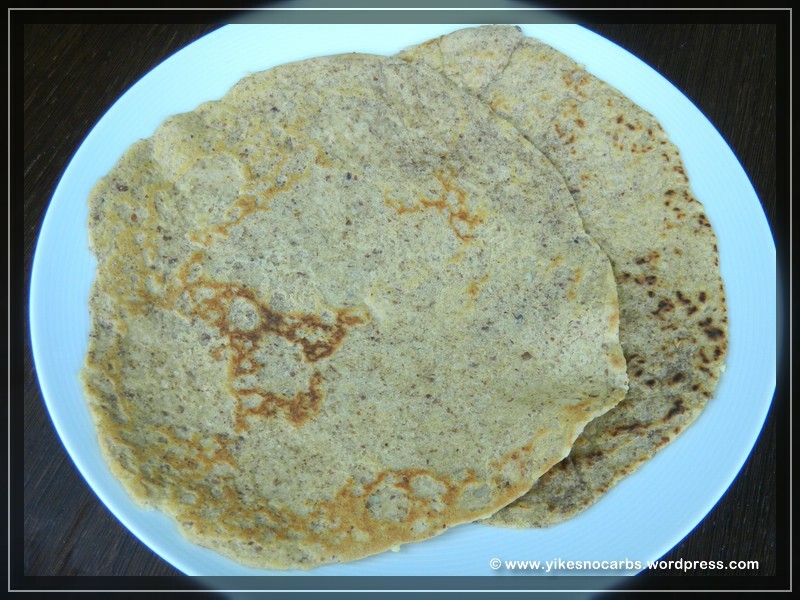 In the meantime, if you’d like to try out the low carb tortilla recipe before I get around to making it again, the recipe can be found here. I would reduce the salt to about 1/2 tsp. I rolled out the dough between two sheets of plastic wrap, peeled off one layer of plastic wrap, flipped the tortilla into my crêpe pan and peeled off the other layer of wrap. You do have to be careful though, that the plastic wrap doesn’t touch the hot pan and melt. I rolled out the dough quite thin so it would have been difficult to handle had I peeled off both layers of plastic wrap and then tried to put the tortilla into the pan. These make really good tortilla wraps. 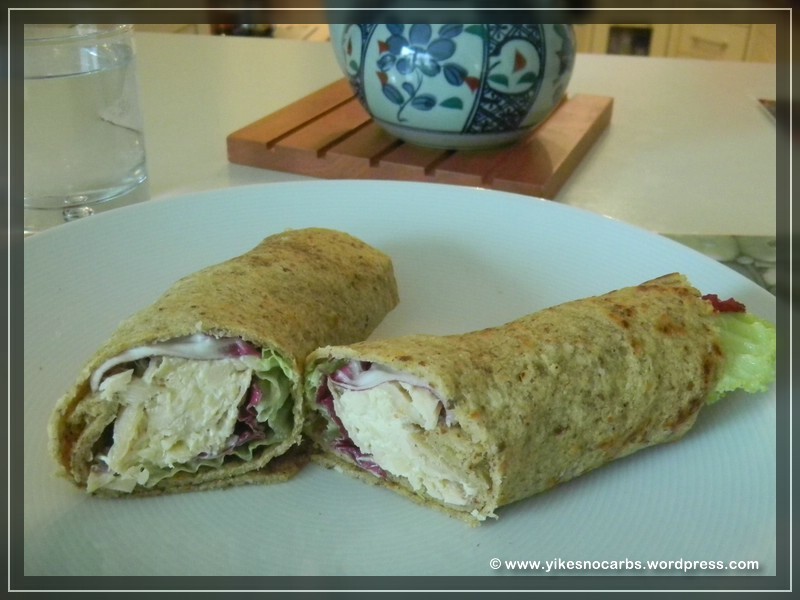 To make the low carb chicken wraps above, simply mix some shredded roast chicken with cream cheese and grated Swiss cheese, add some seasonings, pile the filling onto the wrap lined with lettuce (or veggies of your choice) and then roll up tightly. Cut in half and enjoy! Owing to the different brands of ingredients I used and probably, the calorie counter the original author used, I have ended up with less carbs. Just wondering if these result in a flexible tortilla or brittle? Been trying many different recipes and I am hoping to find one resulting in something I can roll around filling without it breaking. The tortillas aren’t as firm as the flour tortillas. You can roll them up but holding them in your hands to eat without them tearing could be a problem depending on how much liquid is in your filling and the type of filling you use. Mine rolled up pretty well with no tears and we ate with a fork and knife. I’ll have to make these again soon.